Annan Athletic returned from Central Park with 3 precious points in the bag to keep their hopes of a play off place firmly alive. It was not a pretty game played on a damp dreich day and it took the once piece of quality from Darren Ramsay to settle the match when he struck a glorious 25 yarder into the corner of the net in the 52nd minute. The victory on an afternoon when closest rivals Clyde and Montrose all lost ground to Annan. 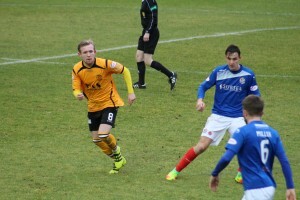 The manager gave a vote of confidence to the team which lifted the points against Edinburgh City with only one change made to the starting line up with the unavailable Steven Black’s position being taken by Raffi Krissan who took up the central defensive role alongside Steven Swinglehurst. Cowdenbeath opened up the Annan defence in the 5th minute when Lewis Moore did well to send in a dangerous cross to the heart of the Annan defence. Minutes later Annan responded when Max Wright’s cross found the head of David McKenna who headed narrowly past the post. Cowdenbeath forced several corner kicks without creating anything of note both defences were sound and scoring opportunities in the final third were at a premium in a first half where neither keeper had a serious save to make. The second half started with the home team on the attack and Dale Carrick’s header at the start of the half gave the home support hope but the effort was easily saved by Currie in the Annan goal. The defining moment in the half arrived in the 53rd minute when Weatherson’s header from a long Currie kick out was perfectly weighted into the path of Darren Ramsay who took three steps forward to finish with a superbly struck low effort from 25 yards into the bottom corner of the net to give Jamie Sneddon no chance. Robbie Buchanan’s well struck shot in the 59th minute went narrowly past the post as the home team tried desperately to pull back the deficit. The home team were pushing forward in an effort to unlock the Annan defence and in the 63rd minute they were presented with an opportunity after they were rewarded with a free kick but Fraser Mullens kick from 25 yards out was directed straight into the arms of Currie. The home team were relieved to see Gerry McLauchlan’s header float narrowly past the post for a corner after Blair Currie’s kick was directed at the heart of the Cowdenbeath defence. Robbie Buchanan’s 67th minute effort was once again directed into the arms of Currie. Darren Ramsay’s effort from 25 yards did not test Sneddon in the 69th minute. Annan conceded a free kick wide on the left in the 72nd minute with Kris Renton heading over the bar. Minutes later Max Wright hit a spectacular net bound shot which was heading into the top corner of the net until keeper Jamie Sneddon pulled off a spectacular save to push the ball over the bar. Annan were looking menacing as the game entered the last 15 minutes and in the 82nd minute they were awarded a penalty kick when Max Wright was pushed in the back but Wright grabbed the ball and his spot kick was directed right down the middle but was saved by Sneddon to keep his team in the match. Cowdenbeath pressed forward in an effort to grab something from the game but they lacked any real threat to a tight Annan defence which has now gone 2 games without conceding a goal, something they have not done all season. It was a day when Clyde’s play off hopes were dented following their 4-1 defeat at the hands of Elgin City who made ground on Arbroath who shared the points with a 1-1 draw against Stirling Albion, Berwick Rangers lifted the points with a last minute winner and eased their way away from the bottom following their 2-1 home victory over Forfar Athletic. Montrose and Edinburgh City shared the points in a 1-1 draw. It all points out to another interesting week end next week when Clyde visit Galabank for a match which is of vital importance to both teams who are seeking to make the play offs. COWDENBEATH : Jamie Sneddon,Shaun Rutherford, Gerry McLauchlan, Kyle Miller, Fraser Mullen,Liam Henderson (Brian Ross 80 min), Kris Renton, Lewis Moore (Matthew Rooney 70 min), Dale Carrick, Scott Rumsby, Robbie Buchanan. Subs not used : David McGurn, Burton O’Brein, Jamie Pyper, Cameron Muirhead, Craig Johnston. ANNAN ATHLETIC: Blair Currie, Jean Guy Lucas (Callum Home 35 min), Jordan Stewart, Raffi Krissan, Steven Swinglehurst, Gavin Skelton, Max Wright, Darren Ramsay, Peter Weatherson, David McKenna (Aiden Smith 88 min), Nathan Flanagan (Rabin Omar 79 min). Subs not used : Alex Mitchell, Smart Osadolor, Przemyslaw Dachnowiwicz, Tom Fry. REFEREE: Craig Napier. ASSISTANTS Alasdair Ross and Scott Leslie .